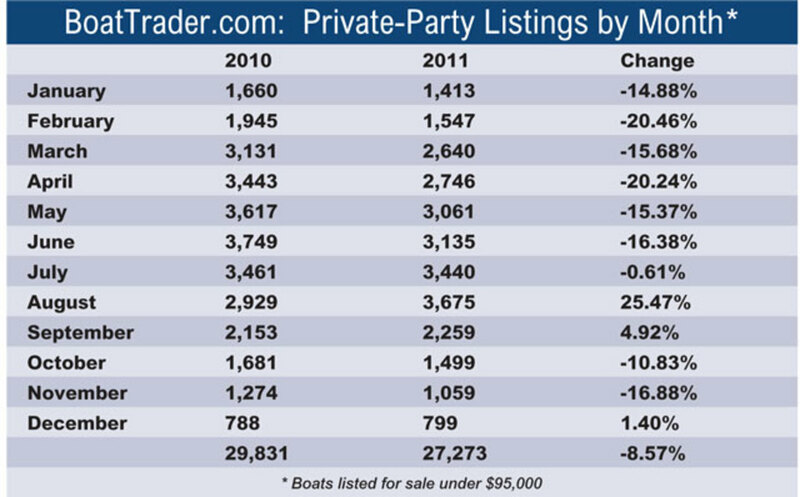 Last summer we reported in DataTracker a breakdown by price of the private-party boat listings on BoatTrader.com. All but about 10 percent of the 26,000 to 30,000 boats usually offered in a given year were in the price range below $95,000. More than half, as we reported at the time, were in the $10,000 to $40,000 range. In January, with the year recently ended, we tracked the listings in the under-$95,000 range, comparing 2010 and 2011, and found that the total number of boats offered for sale declined 9 percent, to 27,273 in 2011, from 29,831 in 2010. The biggest change came in the first half of the year, when listings were fewer by double-digit percentages each month. This could be a reflection of efforts people made to sell their boats at the end of the recession in 2010, but other factors no doubt played a role. For the July-to-September summer period as a whole, the number of listings increased, compared with 2010, and there was a big surge in August. In the early fall, listings decreased again before they flattened in December, the time of year when the fewest new listings are posted at BoatTrader.com.